While we all love movies and going to the theater, most of us can’t see everything on the big screen This means making decisions about which movies are “must see” on those massive movie screens, and quite frequently, those movies tend to be big action blockbusters. After all, there’s nothing quite like seeing a big blowout action scene in a dark theater on a giant screen. 2018 gave us three spectacular Marvel Studios movies and it started off with a bang with Black Panther. It was a remarkable movie for any number of reasons but one of the most important was the way the story used its villain, Michael B. Jordan’s Killmonger. He’s the film’s “bad guy” but he has one of the most relatable, and potentially justifiable, motivations of any character in the MCU. This is what makes the first battle between Killmonger and T’Challa so good. The fight scene isn’t simply an excuse for action, it’s an important moment that helps tell the story, as all action scenes should. We learn a great deal about both characters, especially Killmonger. While Black Panther ends with the traditional Marvel CGI spectacle, this fight scene is much simpler. Nobody has superpowers, and nobody is wearing magic armor. This makes the fight much more visceral. The audience feels like an actual spectator standing at the waterfall, along with all the other characters of the film. Just because it’s nice to get a simple one-on-one fight sequence now and then, it doesn’t mean there’s anything wrong with the massive CGI-filled action explosion. Pacific Rim Uprising certainly gave us that in a huge final battle that destroyed several kaiju, a few giant robots, and most of Tokyo. Where the original Pacific Rim was a remarkably grounded story considering its premise, the sequel went all-in on the fact that it was really just a giant monster fighting movie and wore it like a badge of honor. The big blow out fight at the end sees multiple robots taking on multiple monsters,which heralds that many more cool weapons, satisfying monster deaths, and by the end, it seems everything capable of combusting has exploded in a glorious display. It’s movie fun in its purest form. Almost as soon as we are introduced to the OASIS, we jump into the race that sees our main character jump behind the wheel of the Back to the Future Delorean and race against countless other characters. Other vehicles are being taken down by competing racers as well as the various obstacles of the course like dinosaurs and King Kong. It’s a remarkable introduction to the digital world we’ll be spending most of the movie inside, and one you’ll want to watch again and again if only to find all the pop culture references that went by too fast to see the first time. The massive final battle is probably the most memorable action sequence in Avengers: Infinity War. However, it’s so big and overwhelming that, while there are some absolutely spectacular moments in it, we never really feel like we’re actually seeing the entire battle, it’s just too big. This is why the much smaller sequence where Captain America, Falcon, and Black Widow come to the rescue makes the list. It’s far more satisfying. This is really the finale of a larger sequence that starts with Wanda and Vision under attack from two members of Thanos’ Black Order, but from the moment we hear the opening strains of the Avengers theme, we know we’re in for something special. Cap comes out of the shadows, but he’s really just a distraction so Falcon can fly in and kick somebody in the face. Then Black Widow comes in and shows us why she’s so deadly. It’s one of the few moments where our heroes get a definitive victory in the movie. The Order gets completely dismantled by our heroes. It’s only a couple of minutes long, but it’s beautiful. From the beautifully choreographed way that Domino’s luck is demonstrated, to the close quarters hand-to-hand fighting and gunplay, pretty much everything about this sequence is fun to watch. It’s easy to overlook just how good the action is because you’re laughing so hard but it’s clear that director David Leitch has done his best to make Deadpool 2 a great action movie as well as a great comedy. The original Incredibles was one of the best superhero movies ever made when it was released, and while the sequel doesn’t hit quite that high note, it’s a perfectly solid movie both as a Pixar family drama and a superhero action movie. The sequel is Elastigirl’s time to shine, and she certainly does with a solo action sequence that shows us just how formidable a hero she really is. Starting with a high-speed chase on a specially designed motorcycle and moving on to trying to stop a runaway train, this animated action scene is as good anything we saw in live action this year, and better than a lot of it too. If a year ever comes where a Mission: Impossible movie doesn’t make a list like this, then it’s probably time to hang up the franchise. You can always count on Tom Cruise and company to put on a stunning visual display and Mission: Impossible – Fallout was no exception. It’s hard to choose which big action setpiece from the film should be on the list, and I’m not filling up half the list with this one movie. 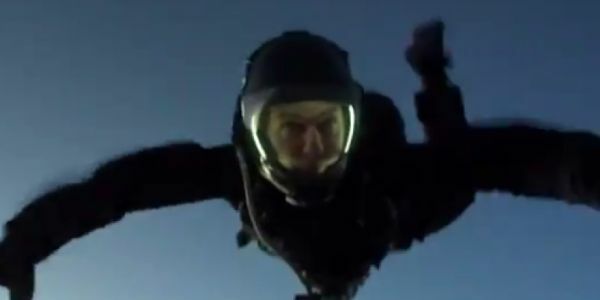 In the end, it has to be the most impressive stunt, the HALO jump that saw Tom Cruise actually jump out of an airplane, several times, at a height no actor had ever jumped out at before. If that had been all, it wouldn’t have made this list. But we then see Cruise pull off some impressive action, in three long take sequences, that just ups the impressiveness of this to new levels. The Meg is a movie that takes itself only as seriously as it needs to and then lets the rest just go crazy. While the massive megalodon only terrorizes our band of heroes for most of the film, in the finale the creature gets loose and goes after a beach full of vacationers. The mayhem is off the charts and it only gets crazier when Jason Statham and his friends start firing torpedos at the thing from single passenger submersibles. It’s bonkers in all the best ways and so much fun to watch. In the movie’s finale, the alternative universe plot and the unique and creative art design come together beautifully, creating a fight between Spider-Man and Kingpin where basically anything can happen, and it usually does. The ground beneath their feet and everything around them is always in flux, so you’re never quite sure what’s going to happen next. Yet, the focus is always on the characters, and the young Spider-Man’s first chance to prove, mostly to himself, that he is worthy of taking up the title of Spider-Man. What makes this sequence so great is the way James Wan has fun with the camera. Our two lead heroes get separated early on in the battle, and rather than simply cutting between the two fights, The camera smoothly transitions between the two. We see Mera running across a rooftop in the background of a fight between Aquaman and Black Manta. After zooming in on her for a while, the camera pans out to catch Aquaman again later. It’s a fun way to follow the action that also allows us to enjoy the beautiful Sicilian scenery.